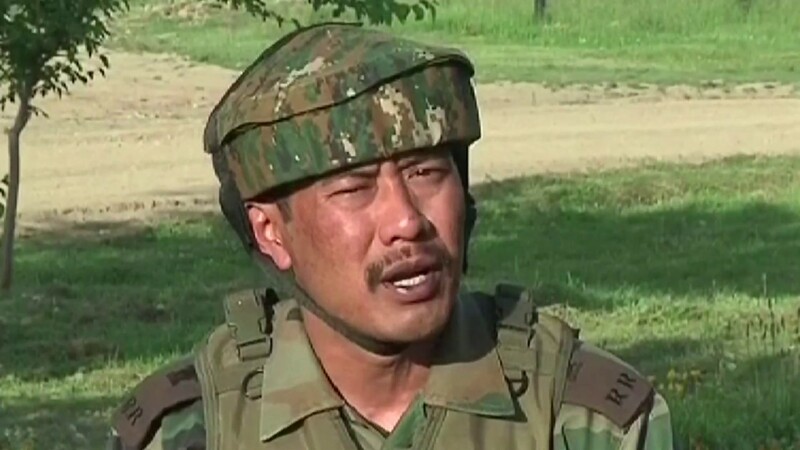 Truth by Kbaig: “Major Leetul Gogoi” Coward Officer of a Demoralized Army! “Major Leetul Gogoi” Coward Officer of a Demoralized Army! Illegal presence of Indian state terrorists (Army) breaking all records of brutality in Indian Occupied Kashmir (IoK) is not hidden from the world. The UN resolution to allow Kashmiris to decide their fate through plebiscite was passed with the vote of the majority. However, India, in spite of allowing the plebiscite has deployed 0.8 million regular troops and 0.5 million paramilitary troops in order to suppress Kashmiris and stage the drama of elections to befool word that these elections are an alternative of the UN-backed plebiscite. Kashmiris have always forcefully rejected this drama but Indian has been imposing puppet governments on Kashmiris while the control of the IoK has been always in the hands of Indian forces. On 09 April 2017, during such a staged drama elections in Budgam; Kashmiris boycotted the so-called elections through protests and stone pelting. Polling stations were deserted. Indian army might have used pellet guns to take the eyesight of the protestors or directly hit them to take their lives but in this way, the drama of successful elections would have badly failed. Indians have invited journalists to show them the people standing in rows to cast vote in order to convince the world that these are not fake elections. In order to handle the protestors, Indian army’s Major Leetul Gogoi discovered such a solution that might be expected from some feudal lord or goon but not from the officer of a professional army. Major Leetul from 53 Rashtriya Rifles has served on different posts before being promoted to the post of Major. All he did shows the mental level, training, and discipline in the Indian army hired to kill and crush the unarmed soldiers. It shows Indian Army is not a professional army but a group Hindu extremists working as mercenaries. Major Leetul Gogoi got hands on 26 years old passer-by Farooq Dar an artisan of embroidery, tied him to the bumper of the jeep. He kept Farooq Dar tied to his jeep for 5 hours wandering through all the areas where the drama of elections was being staged but other areas as well. 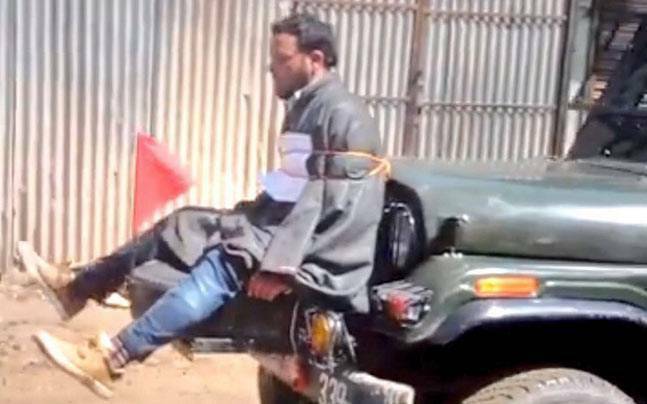 Despite being the ban on Internet, Whatsapp and other social media sites the video of using Farooq Dar as “Human Shield” got viral by Indian soldiers. Indian Soldiers of 53 Rashtriya Rifles recorded and shared these clips with other soldiers. Still, the drama of elections was going on that the video was telecasted by Indian channels showing the low morals and lack of professionalism of the Indian army. With this, discussions broke up on the International media that an Indian army officer has discovered such a cheap solution to save himself from the protestors which even Israeli forces have not done in the Palestine. 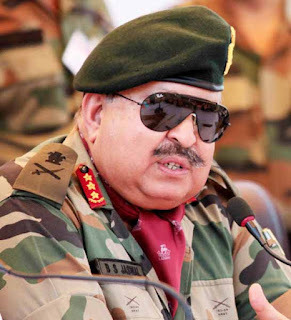 Indian Defense Ministry rejected the stance that Farooq Dar was being used as a Human Shield. Mehbooba Mufti ordered Police to conduct the inquiry of the incident. 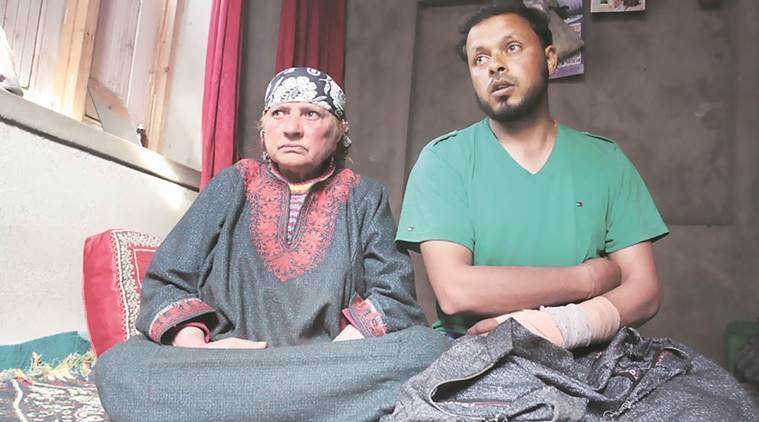 In order to prove themselves innocent, Indian army blamed Farooq Dar for pelting stones on the Indian army’s convoy. He threw heavy stones due to which two Indian soldiers were injured. 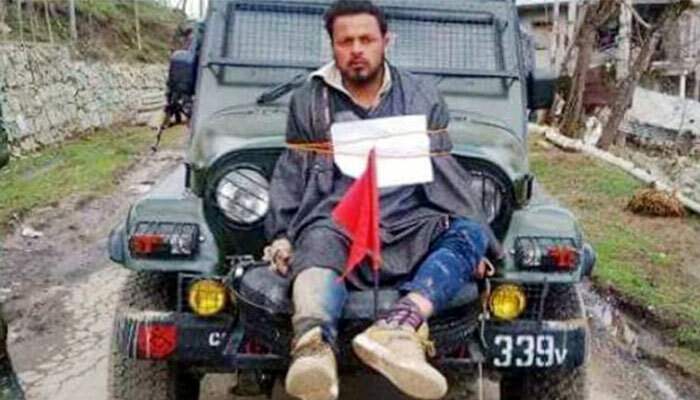 As a reaction, Indian soldiers in spite of killing him or shooting him tied him up with their jeep as a punishment. Indian army’s representative was of the view that they did not tie Farooq Dar as a human shield. 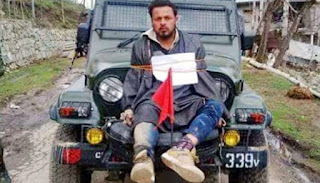 Indian Army Officer Leetul Gogoi was given the award for using Kashmiri man as the human shield. When Farooq Dar was inquired about the incident, he stated that he is a laborer who has not thrown the stone on anyone. He was returning after casting his vote. However, a case was registered against Indian army on 17 April in Budgam Police Station as India has to face severe criticism from within India but internationally as well. This was the only solution in the mind of Indians to stop the protests on the international level. On 19 May 2017, in a press conference that journalists and other while criticizing Indian army they should not forget that Indian army is a responsible institution. Indian army was responsible for assuring the safety of those casting votes, that is why such incident occurred. In the whole story, the column written by Chief Minister of Eastern Punjab Captain (Retd) Amrinder Singh fueled the situation. He severely criticized Indian soldiers especially Major Gogoi and his seniors. According to him, Farooq Dar who was tied to the bumper of the jeep and has to face Indian brutality powerlessly has shown more courage than the Major of the Indian Army. Farooq Dar should be awarded the ‘Distinguished Services Medal’. Army officer should make decisions through the chain of command and should not make such decision that hurts the credibility of the entire army. Major Leetul Gogoi showed his shallowness of courage by punishing a Kashmiri unarmed person who has committed the crime of casting vote against the majority of his countrymen. Although some may say that is an innovative technique which may save lives on both sides, I would condemn it as it is the violation of rights. It is prohibited, Lt Gen(R) BS Jaswal. The discussion was going on that on 28 May 2017, Indian Army Chief Bipin Rawat, destroyed the remaining credibility of Indian army in a Press Conference. The news of awarding Major Gogoi has been already reported in the media through resources. Indian media was waiting for clarification by Indian Army or Ministry of Defense and the reason behind the award. General Bipin Rawat announced to give the award to the coward Major Gogoi, and presented a strange reason behind the award saying that “If Kashmiris take up weapons they will know the strength of the Indian army and it will be easier for Indian army to give them a befitting reply”. If such a wordily statement has been given by some politician this might have been acceptable but such mutilation of the facts by Army Chief is strange. The stance of Indian Army Chief has not been accepted by serious groups in Indian army. They are of the view that in order to save a coward and ineligible Major, Indian Army Chief has supported the Kashmiris' stance that Indian is illegally occupying IoK on gunpoint. Such presence of Indian army is not acceptable for Kashmiris. That is why for 7 decades Kashmiris are continuing their protest and freedom movement sacrificing their lives proving themselves braver than Indian army.